Rep. Todd Porter, R-Mandan, questioned the reciprocity portion of Anderson’s bill, noting that Minnesota’s medical marijuana program “has a whole different set of rules” for a drug that’s still considered illegal at the federal level. Almost three dozen states and the District of Columbia have approved “comprehensive public medical marijuana/cannabis programs,” according to the National Conference of State Legislatures. Jason Wahl, North Dakota’s top medical marijuana regulator, said the state Department of Health opposes the reciprocity provision due in part to challenges verifying other states’ registry cards and because it could allow people to buy forms of marijuana that their home state prohibits. Anderson called reciprocity a matter of “convenience” for patients who travel to other states. She's also seeking to allow physician assistants to sign off on patients’ medical marijuana use. North Dakota voters supported medical marijuana at the ballot box in 2016, overriding the Republican-led Legislature that rejected Anderson’s bill establishing a program less than two years earlier. During the 2017 session, lawmakers overhauled what they said was a flawed statute, and the health department has since been working to license growers and dispensaries. But Anderson said people are “terribly frustrated” that the product isn’t yet available. Wahl said state officials need to ensure the program is “very well-regulated” and anticipated the first medical marijuana products would be dispensed next month, roughly 22 months after Republican Gov. Doug Burgum signed the law. “We certainly empathize with those individuals who have been waiting for the program to become operational,” Wahl said. There have already been some signs of hiccups, however. Rep. Kathy Skroch, R-Lidgerwood, said she has heard complaints from potential patients who can't find health care providers to approve their medical marijuana use. 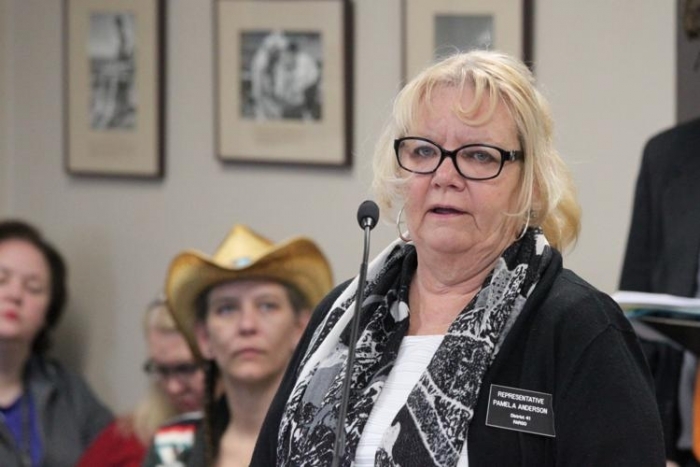 She presented the committee with legislation eliminating the requirement that providers certify that a patient is likely to receive benefits from the drug and instead simply state they have a medical condition that qualifies for the program. “These changes will alleviate the fear of losing licenses,” Skroch said. Dr. Chris Meeker, the chief medical officer at Sanford Health in Bismarck, said the health care system is neutral on medical marijuana and instead leaves it up to individual doctors to decide what’s best for their patients. But he acknowledged some physicians have been leery to sign off on the drug. "If you can avoid making the statement that this schedule I product is going to help you, it just avoids that entanglement," Meeker said. “My hope would be is if you get rid of some of that language, perhaps you’d get some more willingness to prescribe." The House Human Services Committee didn’t take immediate action on the three medical marijuana bills they heard Monday morning. Later this week, lawmakers will hear legislation allowing patients to cultivate their own marijuana plants.